Tonight I’m being interviewed by one of my all time heroes, Eldon Taylor, Hay House author and the genius behind Innertalk. The interview is on Hay House Radio, 7pm (UK time), 11am (PST). 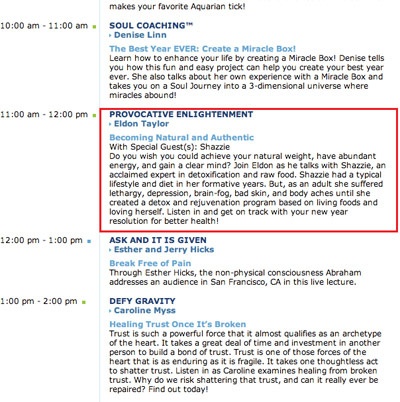 Straight after me is another hero, Esther Hicks. I love Hay House and all Louise Hay‘s creations so much, it feels like the biggest honour to be interviewed on their radio station. It’s not a fame thing because I’ve been on national television and that didn’t phase me. It’s more like a biggest love and respect and adoration and gratitude thing. Over the years, Louise Hay and her authors have altered the face our our bookshops and even our language. We wouldn’t be what we are without them, for sure. I hope you can listen to and enjoy the show. It’s going to be such fun for me and a bit peeky experiency too! Awesome – that’s really cool! I love Inner Talk – I have the Creative Writing one – which helped me write my book. I love the crashing waves of it. Omg what a delicious dream come true to reach Hay House stature and no one deserves it more than you! Brava! I’m so behind on fun and missed it, is there a way to still be able to hear it Sweetness?